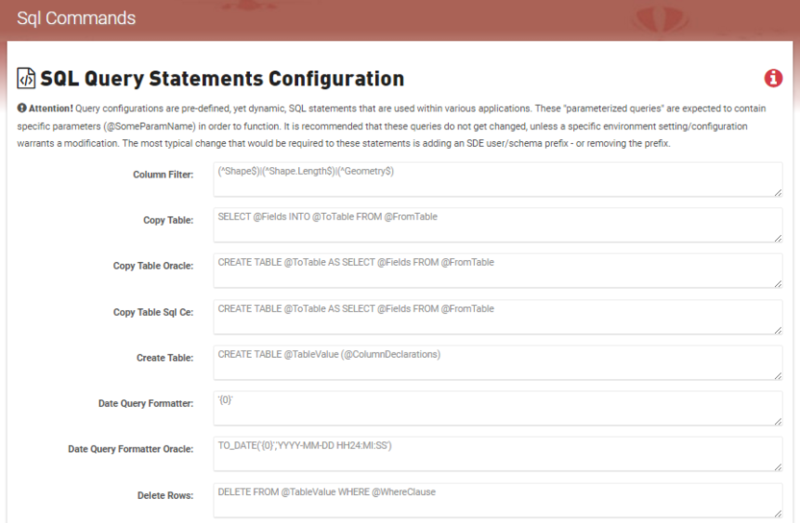 The applications make use of many SQL statements internally that are pre-defined, yet dynamic SQL query configurations. These "parameterized queries" are expected to contain specific parameters (@SomeParamName) in order to function. It is recommended that these queries do not get changed, unless a specific environment setting/configuration warrants a modification. The most typical change that would be required to these statements is modifying the user/schema prefix for SDE-related objects - adding, updating or removing the prefix. Click inside the text field and update the SQL statement as needed. Use the Reset button to reset all SQL statements back to the defaults. Heads Up! It is possible that other SQL statements not listed, may also be reset.